Recently released official data shows that China’s economy performed poorly across the board in October. Several key indicators hit new lows and fell below market expectations. Many Chinese businesses, including prominent firms, have failed since the start of 2018. The Chinese authorities claim that unemployment has been kept stable at about 4 percent. Non-government Chinese researchers and economists estimate that China’s real unemployment rate is about 22 percent. The CCP’s claim that migrants workers are returning home from urban to rural areas to partake in “entrepreneurship” is likely an attempt to put a positive spin on rising unemployment. According to the macroeconomic, financial, and fiscal data released by the Chinese authorities on Nov. 13 and Nov. 14, China’s economy worsened significantly in October, with key metrics like industrial production and social financing falling below market expectations. The poor economic performance across the board suggests that the Sino-U.S. trade war is taking its toll. The Chinese Communist Party has downplayed its “guo jin min tui” (“the state advances, the private sector retreats”) economic policy in favor of promoting private enterprise as China’s economy worsens. The policy shift, however, does not appear to have stemmed rising corporate failures and unemployment. With the trade war and escalating China-U.S. tensions, the CCP is facing an unprecedented political crisis. Industrial output grew 5.9 percent from the previous year, and 0.1 percent from September. September saw China log its slowest industrial output growth rate in a year. Retail sales of consumer goods totaled 3.55 trillion yuan (about $512.97 billion), an 8.6 percent growth from a year earlier. October’s retail sales growth was the second-slowest in a year. Total social financing grew by 728.8 billion yuan, the lowest in 27 months, and barely a third of the 2.21 trillion yuan in September. Broad M2 money supply rose 8 percent from the previous year to 179.56 trillion yuan. Narrow M1 money supply grew 2.7 percent, the slowest pace since January 2014. Renminbi loans increased 697 billion yuan, almost half of the 1.38 trillion in September and the lowest amount of loans in 2018. The outstanding amount of foreign currency deposits at the end of October was $738.7 billion, down 5.2 percent ($40.1 billion) from the previous year, and $5 billion from the previous month. The national general public budget revenue was 1.572 trillion yuan, down 3.1 percent from a year ago. Tax revenue was 1.346 trillion, a 5.1 percent drop from October 2017. Domestic cell phone makers shipped a total of 38.533 million units in October, a year-on-year increase of 0.9 percent and a 1.3 percent decrease from a month ago. Between January to October, the domestic cell phone market shipped 343 million units, down 15.3 percent from the previous year. Auto sales fell 11.7 percent from 2017, the fourth consecutive month of declines. September and October saw double-digit drops in auto sales. Between January to October, the total volume of auto sales was 22.87 million units, down 0.1 percent from the previous year. The cumulative growth rate of auto sales also fell for the first time in 30 years. China’s integrated circuit (IC) imports totaled 34.2 billion units, down 10 percent from a year ago. The total value of IC imports was $29.183 billion, a drop of 16.4 percent year-on-year. ICs, which include semiconductors and other key electronics, are important components used in China-manufactured products like computers, cell phones, and other electronic devices. Second-hand property transactions in 10 cities (Beijing, Shenzhen, Suzhou, Wuxi, Hangzhou, Nanjing, Xiamen, Chengdu, Qingdao, and Jinhua) totaled 39,000 units, down 25 percent from the previous month and down 9 percent from the previous year. Excluding transactions during the Lunar New Year holidays, October’s transactional volume hit a 48-month low. The Purchasing Managers’ Index fell to 50.2 points, the lowest since July 2016. A reading above the 50-mark indicates expansion and a reading below signals contraction. The following day, Western media outlets reported that China had provided the U.S. with written responses to the Trump administration’s trade asks. Sources of news outlets said that the Chinese responses were largely a rehash of previous commitments. In other words, Beijing does not appear to be willing to make the sort of structural reform demanded by Washington. “They are not close to a favorable deal on trade. Not in the same universe,” a source told Reuters. On Nov. 20, White House economic advisor Larry Kudlow told Fox News that President Donald Trump told him on a “number of occasions any deal between the two countries has got to be in American interests without any question. 1. October was a bad month for the Chinese economy. Aside from the poor economic numbers above, Chinese companies are reportedly going into “spontaneous austerity,” and the country is seeing negative growth for the first time. The deterioration of the Chinese economy also appears to be accelerated by the Sino-U.S. trade war. In April Fuguiniao Co. Ltd., a footwear and casual menswear company which was known by the moniker “China Leather Shoes King,” filed for bankruptcy. In May, the Zhejiang-based DunAn Group, a top 500 company in China, repaid a 1 billion yuan ultra-short-term financing bond to avoid defaulting on a 45 billion yuan debt. In June, Shandong Changlin Machinery Group Co., Ltd., a top 100 machinery company in China, went bankrupt. In July, soybean crusher Shandong Sunrise Group, a top 500 private company in China and once one of the largest soybean importers in the country, filed for bankruptcy. OptimumNano Energy Co., Ltd., one of China’s largest lithium battery and electric vehicle battery manufacturers, filed for bankruptcy. The Shenzhen-based OptimumNano has a company valuation that is in the 10 billion yuan range. In August, four big companies filed for bankruptcy: Bohai Steel Group Co. Ltd. (top 500 Chinese company); Shandong Yongtai Group (top 10 tire Chinese company); Chengfeng Furniture Co., Ltd. (a leading furniture company); and haolaiwuchugui.com (another top furniture company). In October, Yankuang Lunan Chemical Fertilizer Factory, a world top 500 fertilizer manufacturer and distributor, went bankrupt. Gionee, a Chinese smartphone manufacturer based in Shenzhen, defaulted on 1 billion yuan of bonds and laid off over 10,000 workers. Gionee ranks sixth by sales among Chinese smartphone makers. In November, Gionee’s suppliers sued for a bankruptcy reorganization of the company. According to Chinese financial media Caixin, Gionee owes billions of yuan to over 100 suppliers, and seventy-five percent of Gionee employees have been cut since April 2018. Information on China’s weakening economy can also be directly or indirectly gleaned from mainland media outlets. On Oct. 22, the Chinese internet portal Netease reported that the number of unemployed exceeded 2 million while 453 publicly listed companies saw their chairman either fired or resigned in the first half of 2018. The report also noted that 5.04 million enterprises shut down in the first half of 2018. Per a March 19 report by China’s Economic Daily, there were over 31 million enterprises in China (out of over 100 million other market entities) as of March 16, 2018. Going by Economic Daily and Netease’s figures, at least one-sixth of Chinese enterprises may have folded in the first half of 2018. The number of business closures may be much higher than the 5.04 million reported by Netease by the end of the year. On Oct. 20, Sohu.com reported that the advertisements page of a recent edition of the Shenzhen Economic Daily broadsheet was crammed full of liquidation announcements by local companies. The report noted several reasons for the mass closure of enterprises, including business owners looking to avoid social security and taxation penalties that go into effect in January 2019 due to a July reform or entertainment companies trying to comply with tougher scrutiny of their tax payments following the Fan Bingbing scandal (for deeper analysis on the social security and taxation changes, see our September article). 2. Rising unemployment usually follows corporate failures. In October 2018, prominent Chinese economist He Qinglian used data issued by the National Bureau of Statistics on March 14 to estimate that the real unemployment rate in China is over 22 percent. He’s estimate is within range of an earlier estimate by the Xinghuo Journalists’ Alliance (星火記者聯盟) in June 2017; Xinghuo’s report, “China’s Unemployment Rate, the Truth is Being Covered Up,” concluded that the real unemployment rate could be as high as 22.9 percent. The CCP regime, however, continues to issue incredulously consistent unemployment rates despite the obviously weakening economy. According to recent data from the National Bureau of Statistics, China’s urban unemployment rate in October was 4.9 percent, or the same rate as in September. The statistics bureau notes that national unemployment rate has kept steady at between 4 percent and 4.3 percent in the 2000s. The CCP also appears to be employing euphemism to hide the unemployment situation. On Nov. 8, Zeng Yande, the director of China’s agricultural ministry’s rural industry development department, said at a farmers’ technology, innovation, and entrepreneurship expo that the number of “returning entrepreneurs” to rural areas totaled 7.4 million while “non-agricultural entrepreneurs” totaled 31.4 million. Zeng said that the growth rate of “returning entrepreneurs” and “non-agricultural entrepreneurs” remained constant at double-digit figures. The “returning entrepreneurs” and “non-agricultural entrepreneurs” comprise of migrant workers, college students, retired military veterans, as well as scientific and technical personnel, and have an average age of 40. The CCP seems to have been preparing for the rise of rural “entrepreneurship” for a while. The State Council has issued guidelines promoting “entrepreneurship and innovation” in rural areas every year since 2015. 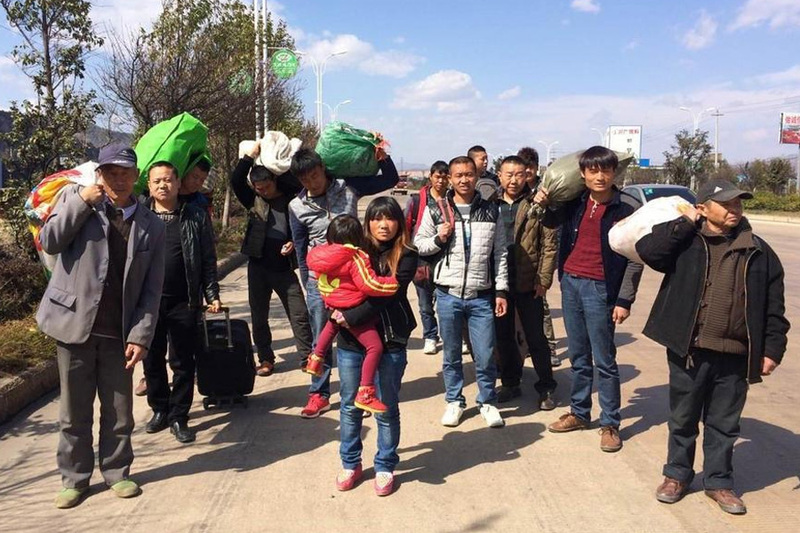 In January 2018, a State Council meeting chaired by premier Li Keqiang announced that rural startups will get more public financial support, a move which overseas commentators described as “Xi Jinping’s Down to the Countryside Movement.” Meanwhile, a Jan. 18 China Daily report noted that seven million people (68.5 percent returning migrants) had gone home to rural areas to embark on “entrepreneurship” since September 2017, and that the “entrepreneurs” were on average 44.3 years old. In contrast, there was a total of 38.4 million “entrepreneurs” of average age 40 in the rural areas by November 2018, according to the agricultural ministry. The trend of “entrepreneurs” looks to exacerbate in the future given the double-digit “new entrepreneurs” growth rate as cited by China’s rural industry development department director Zeng Yande. While the “returning entrepreneurs” may have actually found jobs or created “startups” in rural China, their condition will almost certainly be a step down from those in the urban areas. Many Chinese leave their rural hometowns for the cities in the first place due to the under-developed agricultural economy and lower standards of living. In the cities, migrant workers struggle to pay ever-increasing rental prices, look for jobs, or keep their work when firms close due to the economic downturn. Things got even harder for rural migrants in late 2017 when first and second-tier cities started implementing policies to drive out the “low-end population,” a term which usually means migrant workers. Upon returning home, many find that they have lost their land or possess no farming skills. Finally, because the economy in rural areas is poorer than in the cities, those areas will find it difficult to meet increasing employment needs. Earlier in the year, a National Bureau of Statistics official offered a glimpse at China’s dire unemployment situation. On March 14, a statistic bureau spokesman said at a press conference that there are over 900 million people of working age in China, but only a total of 776 million jobs. Meanwhile, China is expected to produce a record 8.2 million university graduates in 2018, as well as 5 million graduates of vocational institutes. The spokesman also noted that the job-seeking crowd would be bolstered by “transfer workers” following a reduction of excessive production capacity and rural migrant workers moving to the cities. Going by the numbers above, there are 124 million people of working age in China that may not be employed at the moment. Add 13.2 million graduates, the “transfer workers” who are out of job due to the CCP’s supply-side reform, retrenched workers from companies going bust, and increased urban populations, and Beijing faces an unemployment crisis. China’s unemployment woes will likely worsen with the escalating Sino-U.S. trade war and rising geopolitical tensions. We believe that the business failure and unemployment trends listed above will only intensify, especially when U.S. tariff rates increase to 25 percent in January 2019 and if President Trump adds another $267 billion of tariffs. Rising “stability maintenance” costs will place an increased burden on government finances.